In his classic 1973 overview of U.S. agribusiness and its effects on the food we eat, Hard Tomatoes, Hard Times, Jim Hightower discusses how the search for market efficiencies had changed the tomatoes Americans could buy in their local supermarkets. Tomatoes posed a number of problems for modern industrial agriculture; in particular, they tended to get bruised or smashed when harvested by machine and transported long distances. To facilitate mechanical harvest and shipping, varieties were developed that were harder and tougher — often at the expense of other qualities, such as taste. This same process has occurred with many crops. For instance, I can buy huge, bright red strawberries year-round in the U.S. these days, as long as I don’t mind that they have only a hint of the rich taste of the strawberries my grandma used to grow. As a result of concentration in agribusiness (including grocery chains) and selection of varieties that can withstand the mechanical harvesting and long-distance shipping required by the industrial food system, we see fewer and fewer varieties of crops on the shelf. Despite the efforts of heritage seed banks and heirloom variety enthusiasts, many have disappeared altogether; others are dangerously close to doing so. It’s an enormous loss of genetic diversity, of varieties that were developed over many years based on flavor, resistance to pests, ability to withstand drought, frosts, or other environmental stresses, and so on. Dolores R. let us know that National Geographic posted an image based on a 1983 study by the Rural Advancement Foundation International that illustrates the loss of this genetic diversity. RAFI looked at a typical commercial seed catalog from 1903 — that is, a catalog of seeds targeting farmers producing for the market. They found a large number of varieties available. Of course, the NCGRP isn’t the only organization storing seeds; many private groups, such as Seed Savers Exchange, preserve heirloom varieties. And many varieties have been introduced, such as the Round-Up Ready crops developed by Monsanto to be compatible with Round-Up weed killer. The NCGRP has also added greatly to its collection over time. Nonetheless, many varieties have simply disappeared, reducing the genetic diversity available in our current agricultural system and increasing the risks should a virulent pest or disease attack the dominant varieties of crops and livestock. For more on this, see the full National Geographic article. It is a real conundrum. The optimization and increased efficiency agricultural science has come up with allows food to be cheaper and more wildly available than ever before. But it also can make it more vulnerable to new pests. Personally, I hope we can continue a kind of hybrid system, where efficiency continues to be prized in the large-scale work, but where local heirloom lines are still keep available by those of us who can afford it. Thank you for bringing up this issue- it is of such vital importance and the same transformation from local and specific to global and generic is happening all over the world. I think it is even more serious as the cheap food from high-yielding agriculture is cheap because of the constant access to cheap and readily available artificial fertilizers, pesticides and above all cheap access to oil. With peak oil (and the threat of climate change), the whole foundation for cheap agriculture is cracking - so it is more important than ever to keep alternatives alive. 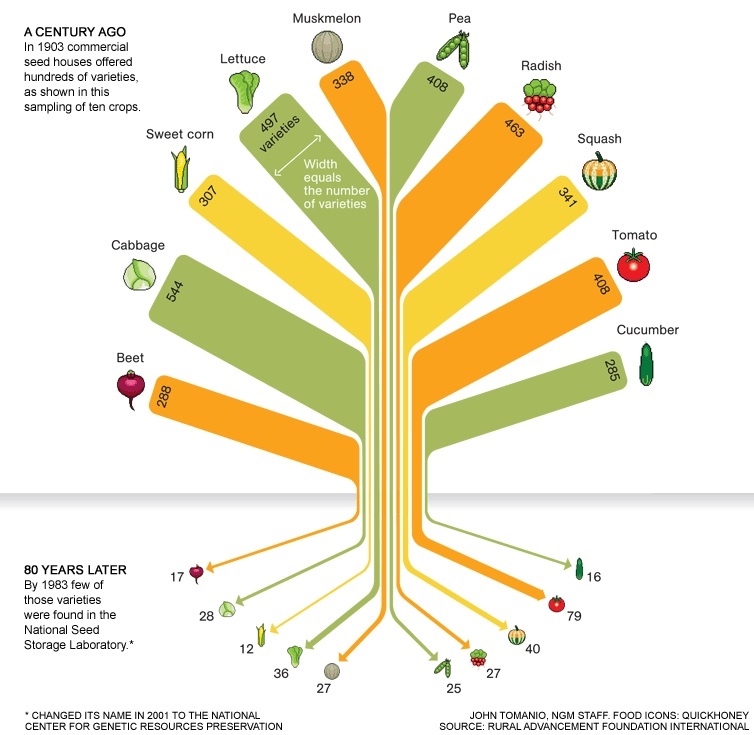 The graphic focusing on a single seed bank is really misleading, and somewhat tangential to the original NatGeo article which largely discussed native varieties that would be unlikely to be listed in a 'typical [American] commercial seed catalog from 1903'. Seed banks are fairly controversial in plant genetics circles. They often have usage rights requirements that many people find objectionable. There are also *many* of them, and overlap between them is somewhat undesirable. I would imagine a lot of the interesting genetic diversity is in agribusiness research facilities. Just because they aren't selling a particular variety of corn doesn't mean they don't have the genes on hold - in proprietary storage that they aren't going to share with their competitors. It is interesting (and scary) the dearth of choice in produce in grocery stores - you'll see the same Fuji apples in chains across the country but whatever's growing in your aunt's backyard is unrecognizable in the store. I recently joined a CSA (privilege! what luxury!) and was surprised to find out there are all kinds of locally-growing foods that I not only have never tried, but didn't even know existed and were delicious. Seed Savers Exchange is one of my new favorite websites--I spend HOURS on there looking at their vegetables and dreaming about what I want to grow. I agree that this is of vital importance, especially when you consider that we need those stock seed lines in case of a significant disease outbreak. Anyone hear of the Panama disease and the end of the Big Mike bananas in the first half of the 20th century? Now imagine if we hadn't had alternative seed lines to develop into the Cavendish we eat today-- we might have lost the banana as a major fruit crop all together. That said, I'm not sure that having milder strawberry strains is so bad. I've tried heirloom strawberries and I found the taste unpleasantly overwhelming. That graph doesn't do much for me personally. I'd like to see a graph that shows what variations those 408 tomatoes had compared to the variations of the few grown today; as well as numbers on the... popularity of those 408 variations. I highly doubt they were all grown in equal quantities.